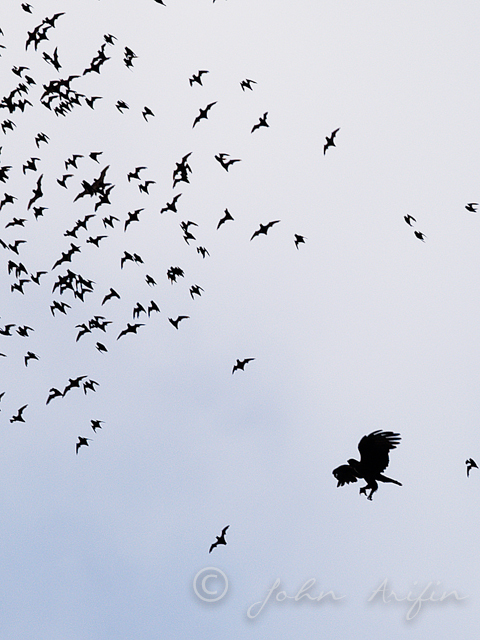 Our first bird watching trip to Sarawak was by far the most extensive and ambitious. It was from 24 July to 7 August in 2006 with Mano to survey the bird density in Sarawak. We embarked on the 15 day bird watching trip in Sarawak from north to south. Our bird expedition started from Mulu National Park near the northern borner of Sarawak next to Brunei to the Southern borner of Sarawak at the borner of Kalimantan Indonesia. The bird watching trip in Sarawak Borneo included the following national parks. It was in 2008 , that we discovered and photographed the extremely rare Dulit Frogmouth. Over the years, we visited Sarawak at least once a year normally for a period of 4 to 5 days. The places that we visited frequently were Kubah National Park & Borneo Highland Resort due to their proximity to Kuching. 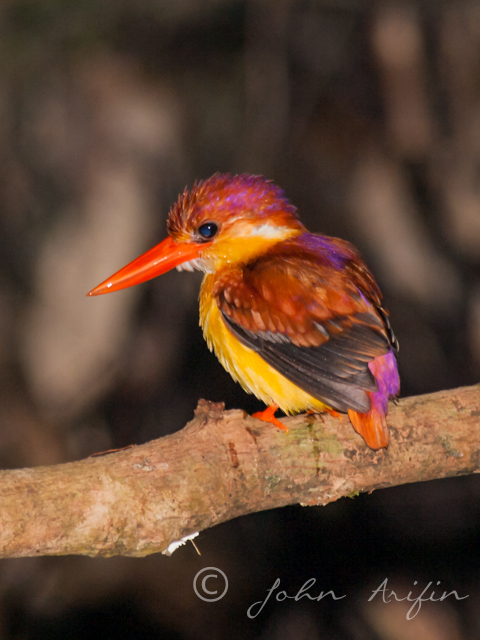 Birds in the tropical rain forest can be very colorful but very difficult to spot in the dim and shadowy canopy. 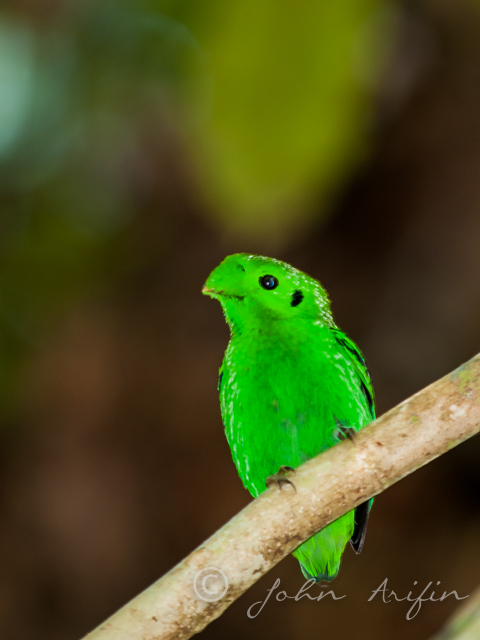 The Green Broadbill, Calyptomena virdis for example can be all but visible to the human eyes. 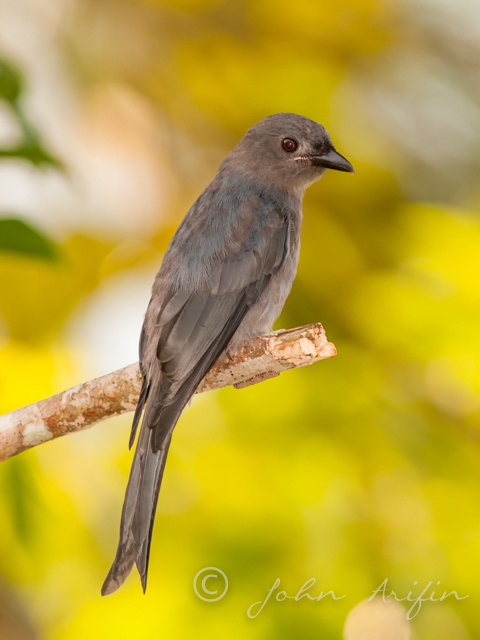 Therefore knowledge of bird call and its behavior would increase the chance of sighting. With the expert help of Mano, I was able to see and hear birds that I would normally miss. Photographing birds in the thick rain forest was not easy especially with all those . We trekked on the average 6 to 7 Kilometer (Km) daily. There were days that we could only hear the calls but not able to photograph them either they are too high up in the canopy or just plain illusive. 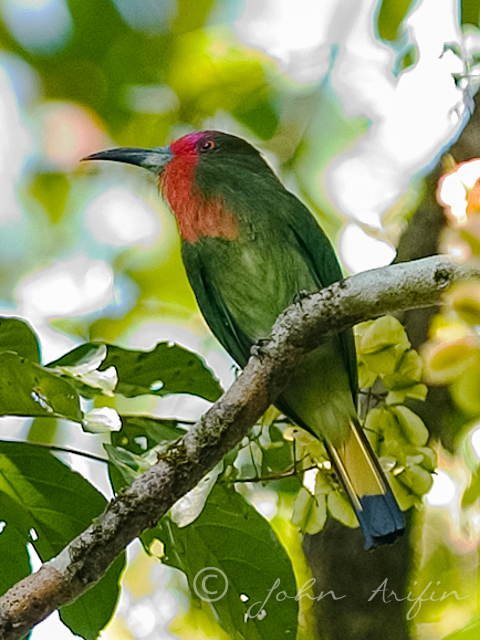 One of our unique encounters was the sighting of the Red-bearded Bee-Eater, Nyctyornis amictus from a canopy walk. Mulu National Park has a 480 meter long canopy walk. It is 20 meter above the ground in the middle of the tranquil and beautiful tropical rain forest over looking the river. The feeling of walking along the canopy walk (treetop walk) is like a lizard crawling from one tall tree to another, 20 meters apart on a thin rope with a 50 meter plunge below you. Suspended by just ropes, with a 30 centimeter wide foot path I was trying to balance my body and to overcome any thoughts of acrophobia, moving one single small step at a time to complete the entire walk. It was during this unexpected moment that I had an eye to eye encounter with the beautiful Red-bearded Bee-Eaters Nyctyornis amictus, with scarlet breast and crown lilac (male) perching on the branch near me. Face to face with the Red-bearded Bee-eater @ the Canopy Walk @ Mulu. 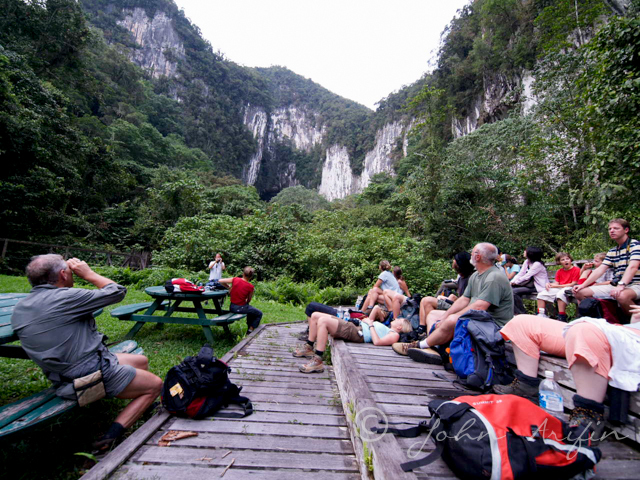 Gunung Mulu National Park invites you to a breathtaking experience of some of the world’s most enthralling wonders of nature. It has a 2377 meter submit which will take 4 days and 3 nights to reach the peak. The main attraction of the park to most visitors will be the caves and the bats. Experience the grandeur of the world’s largest cave passage created millions of years ago. We walked about 3 km from the park head quarter to Deer cave which brought us to the bat observatory. Every night (if the weather is good) you will witness one of the magnificent displays of mass exodus of bats from the cave to feed. The bats will spiral out of the cave in a very orderly fashion for almost an hour (or more). Someone told me that the visual effect is like looking at our computer screen saver, it went on and on and on forever. Among the most sought after bird during this time were Bat Hawk, Machaeramphus alcinus and Rufous-bellied Eagle Hieraaetus kienerii preying on the millions of bats coming out of the cave. Bako is the oldest National Park situated near Kuching, the largest town in Sarawak. Unlike Mulu and Niah, where they are situated in the rugged mountain, Bako is situated at the coastal line with more open forest. With rainforest, abundant wildlife, jungle stream, interesting plant life, secluded beaches and trekking trails, Bako offers visitor an excellent introduction to the coastal rain forest of Borneo. About 150 species of birds have been recorded here. Bako’s lush vegetation represents seven different eco systems ranging from the mixed dipterocarp forest to the desert-like scrub. Besides birds and plants, Bako is the home of about 150 rare Proboscis monkeys found only in Borneo. The male has an odd-looking huge pendulous nose and a large ” beer” belly. We saw them in groups coming down to feed in the early morning and late evening at the mangrove forest not far from where we stayed. Sarawak has so much to offer .Your entry point should be the city of Kuching or Miri. Bako national park can be reached by taxi or bus from Kuching where visitor will arrive at the Bako village. Boat can then be chartered at the village to go to the park head quarter. Accommodations in the park include chalet units, jungle lodge, hostel-style rooms and camping ground. Stay at least 2 to 3 nights in the park. From the town of Miri in the island of Borneo, we took a Fokker 50 propeller aircraft headed for Mulu National Park about 100 km due east. Looking down through the window, I saw nothing but the dense and luscious tropical rainforest with occasional winding rivers that snaked through the jungles. What used to take travelers almost a full day of ridding through dirt roads and winding rivers on boat to reach their destination now took us just 40 minutes by flight. As what the previous travelers always say “getting there is just part of the fun “. Mano & I teamed up in this trip to survey the birds in the state of Sarawak, the largest state in Malaysia in the island of Borneo. Mano is a professional bird guide and tour leader for almost 30 years. I know Mano as a good friend some 20 years back through bird watching. From the year 2006 to now in 2013, many things have changed for the better in the D-SLR. For one thing camera today is capable of shooting at ISO 25,000 while in “old days”,1600 was maximum. 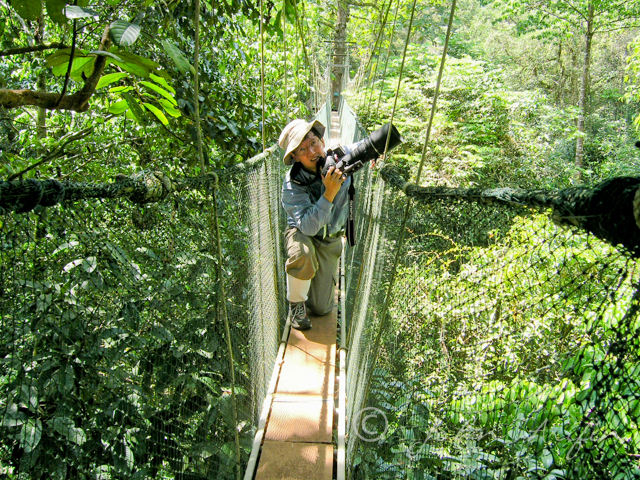 Photographing in the rain forest is not easy as the subjects are elusive and the lighting is poor. Using ISO of 800–3200 is not uncommon in order to balance the ambient light with the TTL flash (slow synch) and maintaining desirable shutter speeds and controlling the noise level. As a rule, it is always better to reduce the noise in camera than to mask it in post processing. The strategy is unique to the tropical rain forest. Auto focus today is so much better even in dimmer light. Therefore making photography so much more easier than before. Birding and photographing birds in Sarawak Borneo is very challenging. Tags: Birding Sarawak Borneo. Bookmark the permalink. hi, I am planning a birding trip to Kuching. Can you give me the contact of Mano as I am looking for a bird guide to take me around. Or get Mano to contact me via my email below. thank you. KP, Mano is from Kingfishers Tours based in KL. PM me at +65 9616 Nine one four nine.